OLD TOWN — Learn about the legacy of Abraham Lincoln at the Chicago History Museum's newest exhibit. The new exhibit, "Lincoln's Undying Words," opens April 9 and will run through Feb. 20 at the museum, 1601 N. Clark St. Walking through the exhibit, visitors will hear actor Michael Krebs as the voice of Lincoln reading excerpts from his famous speeches: "A House Divided" in 1858; his first inaugural address in 1861; the "Gettysburg Address" in 1863; his second inaugural address in 1865; and his speech on reconstruction in 1865, three days before his assassination. Artifacts that help illustrate Lincoln's impact will also be on display, including the Solomon Northup book "Twelve Years a Slave," a portrait that influenced Lincoln's decision to be president, "The Railsplitter," Lincoln's last order to General Ulysses S. Grant and Lincoln's family carriage. The latter has been a "treasured" part of the museum's collection since 1920, but hasn't been on display for the last 30 years, according to the museum. 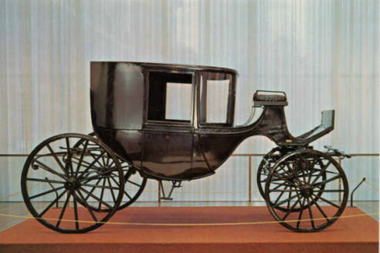 The carriage is significant because Lincoln and his wife rode in it to Ford's Theatre on April 14, 1865, the night he was assassinated. The exhibit, which is a collaboration between the museum and the Abraham Lincoln Presidential Library and Museum in Springfield, Ill., is free with museum admission. For more information, visit the exhibit's website.